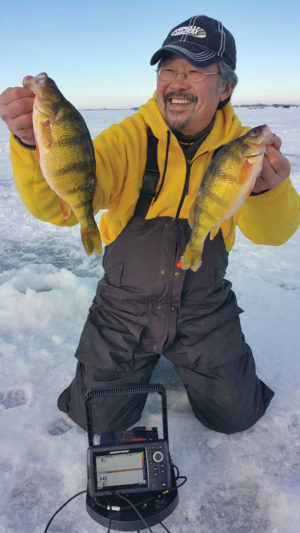 After several weeks of sub-zero temperatures, the ice fishing season across the upper Midwest is finally in full swing. We were able to at last get out on the ice a few weeks ago and what a day it was! Warm temperatures in the mid 30s greeted us as we drove out onto Lake Poinsett in South Dakota, one of the state’s best multispecies fisheries. The ice conditions on Lake Poinsett were more than 12 inches. Permanent fish houses and pickup trucks were scattered all over the lake. Large groups of anglers were congregated throughout the basin of Poinsett and it took some time to figure out where to start. We were traveling with my good buddy, Scott Bauer, and we drove our truck outside of and around the packs of ice anglers until we felt the location was suitable for drilling some holes. Lake Poinsett is one of the largest lakes in South Dakota at almost 8,000 acres, with a maximum depth of about 22 feet. This lake is located in Hamlin County and has several accesses that make it easy to get out to where the fish are. There is a variety of fish that inhabit this lake, including yellow perch, walleye, northern pike, smallmouth bass and crappies. It is one of the best lakes for fishing in South Dakota. After drilling a few holes at 16 feet along the edge of the mud basin and checking them with our new Humminbird Helix 5 Ice Machine, we found several marks, which indicated there were some fish under us. 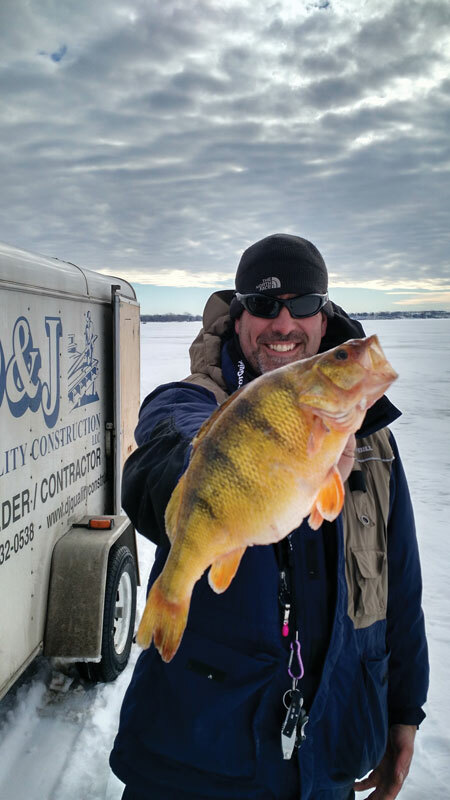 Scott immediately caught four jumbo perch and a couple small walleyes, before the rest of us could even get our rods out of our carrying cases! There was no doubt that we were excited about a great day of fishing! The action was tremendous for the next few hours. Another good friend of ours, “300 pounds of Smitty,” joined us, and we proceeded to pound on the fish. We released numbers of smaller fish and kept some of the extraordinarily large perch that Poinsett is famous for. After talking to some of the local anglers around us, it appeared that the bright, warm, and sunny conditions had really turned the bite on. We didn’t even get there until mid-morning. The extreme early morning bite was tough and the action slowed down for us as the sun drew closer to the horizon. Ted found that banging the bottom with a spoon, tipped with a minnow head or wax worms, was the best technique. It seemed like the fish would be attracted by smacking the muddy silt basin bottom. By lifting our lures a few inches at a time, we were able to trigger bites. It is always a good idea to change your jigging motion several times during the day. This allows you to determine what the fish want at that very moment. Ted was using St. Croix’s new Avid Glass rods and it appeared that they were instrumental in detecting some very light bites. The limber fiberglass tip acts as a spring bobber, which allows you to see very subtle biting fish. The trick to catching the light biters is to see the bite, then let the limber rod slowly bend and then set the hook. These new Avid glass ice rods have just the right action to allow the fish to bite, but not feel the rod above, thus allowing us to get a hook into the fish. We were very comfortable fishing out in the open on the ice during this warm, sunny day. But having a portable fish house/heater available is always a good precaution in case you are going out in more cold, adverse weather conditions. We believe that when fishing on ice, being comfortable catching fish is much more enjoyable than being miserably cold and catching fish. So try taking a trip out to Lake Poinsett, South Dakota and enjoy some of the great ice fishing the state has to offer. It is advantageous to check out all of the online reports and then make a decision on where you want to go. There’s always fish to be caught and fresh perch frying on the pan to be enjoyed.